Designed by creative agency over in Barcelona, the folks over at OmmWriter have really outdone themselves. They’ve created two amazing applications — Ommwriter and Ommwriter Dāna II. 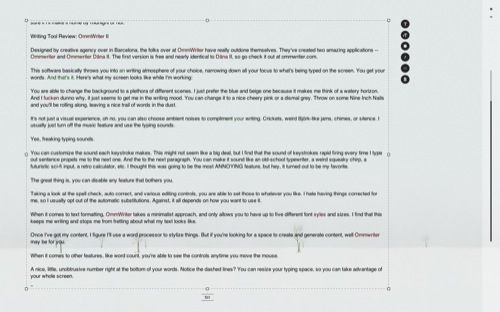 The first version is free and nearly identical to Dāna II (Mac and PC), so go check it out at ommwriter.com. You are able to change the background to a plethora of different scenes. I just prefer the blue and beige one because it makes me think of a watery horizon. And I fucken dunno why, it just seems to get me in the writing mood. You can change it to a nice cheery pink or a dismal grey. Throw on some Nine Inch Nails and you’ll be rolling along, leaving a nice trail of words in the dust. It’s not just a visual experience, oh no, you can also choose ambient noises to compliment your writing. Crickets, weird Björk-like jams, chimes, or silence. I usually just turn off the music feature and use the typing sounds. You can customize the sound each keystroke makes. This might not seem like a big deal, but I find that the sound of keystrokes rapid firing every time I type out sentence propels me to the next one. And the to the next paragraph. You can make it sound like an old-school typewriter, a weird squeaky chirp, a futuristic sci-fi input, a retro calculator, etc. I thought this was going to be the most ANNOYING feature, but hey, it turned out to be my favorite. The great thing is, you can disable any feature that bothers you. Taking a look at the spell check, auto correct, and various editing controls, you are able to set those to whatever you like. I hate having things corrected for me, so I usually opt out of the automatic substitutions. Against, it all depends on how you want to use it. When it comes to text formatting, OmmWriter takes a minimalist approach, and only allows you to have up to five different font syles and sizes. I find that this keeps me writing and stops me from fretting about what my text looks like. Once I’ve got my content, I figure I’ll use a word processor to stylize things. 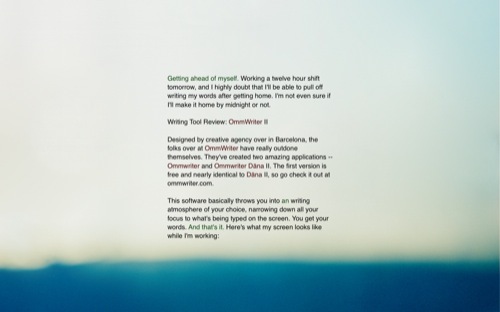 But if you’re looking for a space to create and generate content, well Ommwriter may be for you. When it comes to other features, like word count, you’re able to see the controls anytime you move the mouse. Notice the dashed lines? You can resize your typing space, so you can take advantage of your entire screen. I was so impressed with this gem, I also bought the iPad app so I could plug in and tune out while I’m on the go. Totally recommended. When I first read about OmmWriter, I wondered what kinda hokey hippy BS they were trying to pass off. But this has saved me from writer’s block many times over, and I’m now a complete addict.